This page displays all the campervans that are available for hire in Wrexham . If you would like further information or to speak to the camper's owner about hiring their van please visit their Camperbug page, by clicking below. I am Molly, hire me today! 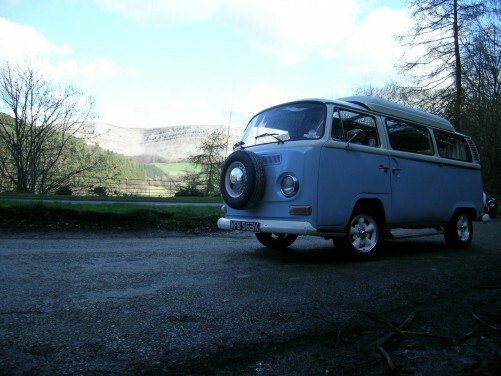 Molly is a 1972 VW Baywindow Campervan. She was fully restored in 2012 with new paintwork and new custom built interior. Molly is ready to take you on a tour of North Wales, Cheshire, Shropshire or wherever the mood takes you. She\'s fully equipped for a family of four with full sized double bed and two bunks in the top. Mr Benn is a 1966 Vintage Split Screen VW Campervan. Discover the perfect transport for your wedding party, if you are a fan of gorgeous vintage vehicles, our Classics are truly spectacular… from the fun and funky VWs to the glamour of the legendary E-Type.